Fredericksburg, Va. – A poll of veteran and military family community leaders and experts found that 85 percent support allowing transgender Americans who meet current physical, mental, and security standards to serve openly in the U.S. military. Sixty-eight percent of respondents rank combat readiness as the most important factor policymakers should consider when determining the future of transgender military policy, and 55 percent rank maintaining military strength second. The Scout Index consists of more than 200 experts and leaders in the military and veteran communities, including representatives from veteran-serving organizations, companies with a focus on veterans, the public sector, media outlets and other related stakeholders. The Index is made up of the men and women who Americans turn to when they need to understand the issues affecting veterans and military families. Among Scout Index respondents, 82 percent say it is inappropriate for the president to announce military personnel policies via Twitter. The full question set can be found below. Follow @ScoutComms on Twitter and subscribe to our weekly Scout Report newsletter for more news and analysis about the veterans and military family communities. 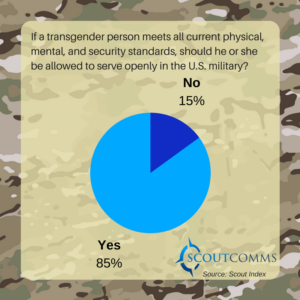 If a transgender person meets all current physical, mental, and security standards, should he or she be allowed to serve openly in the U.S. military? How appropriate is it for the president to announce military personnel policies via Twitter? Rank the factors that should be considered by policymakers when determining the future of transgender persons’ service in the military.